This spacious home with incredible Blackfish Creek views will comfortably accommodate a large group. Located in a quiet neighborhood, ''Crosswinds'' is situated on a private lot atop a hill overlooking the ever-changing marsh. The main living space is on the first floor. Open and bright, there is a separate dining room, living room and kitchen. The dining room has a large dining table with plenty of seating and skylights. 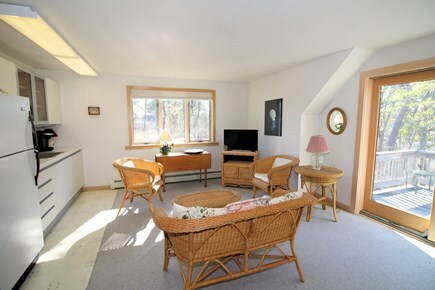 The living room has comfortable seating, a flat screen TV with cable and WiFi, a ductless split unit air conditioner and large windows looking out over the marsh. 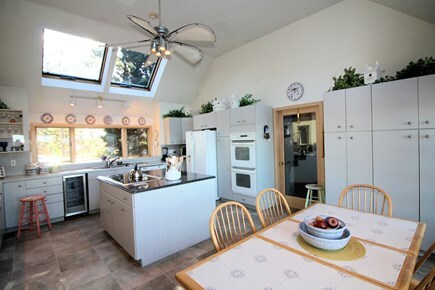 The eat-in kitchen is well-equipped with an island, breakfast bar, dining table, dual wall oven and wine refrigerator. French doors off the kitchen lead to the main deck with outdoor furniture. The kitchen has a ceiling fan and skylights letting in plenty of sunshine. In addition to the main living areas, there is a half bath just off the living room and a bedroom with two twin beds on the first floor. 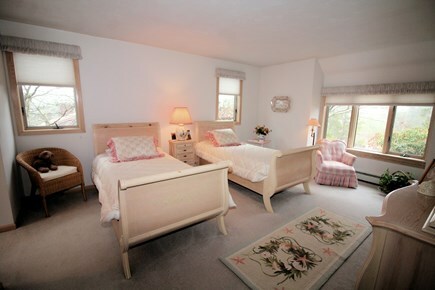 The first floor bedroom has a door to a deck and en en suite bathroom with a separate shower and whirlpool tub. 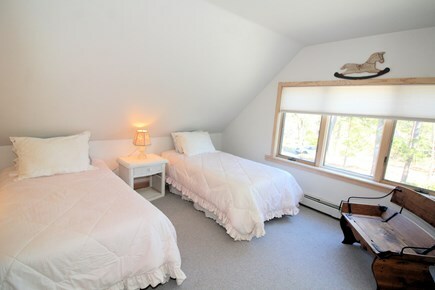 The second floor has a master bedroom with a queen bed, ductless split unit air conditioner, en suite bathroom with dual sinks and a shower stall and a slider to a private deck. 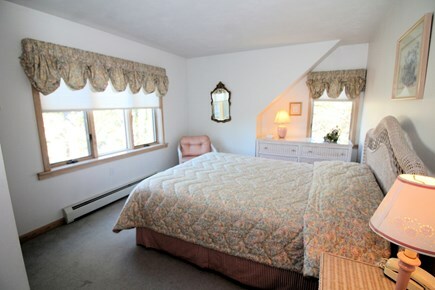 Another bedroom on this floor has a full (double) bed and windows facing the marsh. 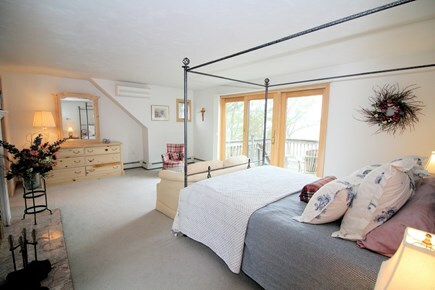 There is also a den (which serves as the fifth bedroom) with a sleep sofa (full/double). 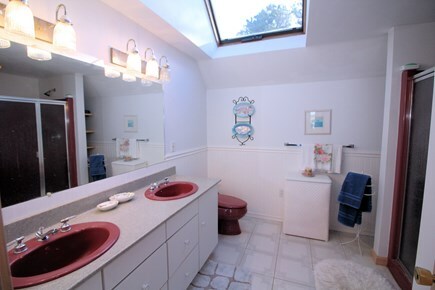 There is a full bathroom with tub/shower on the second floor as well. A door off the kitchen leads to the convenient first floor laundry room with washer and dryer. The garage is just off the laundry room. Guests are welcomed to store bikes and other items in the garage during their stay. An interior staircase from the laundry room leads to a separate apartment. The apartment has a living room with a kitchenette (sink, refrigerator and Keurig coffeemaker) and a flat screen TV with cable. A slider leads to a deck with an exterior staircase. The apartment has a bedroom with two twin beds (may be placed together with a kit to form a king) and an en suite bathroom with shower stall. Open up the doors and windows and you will see why this comfortable home was named ''Crosswinds''! 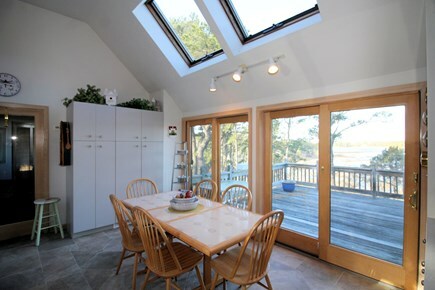 The home has five separate decks, all ideal for lounging and enjoying Wellfleet's wonderful weather. Watch the tide come in and out and enjoy the sunny days and sunsets on Blackfish Creek. Amenities include cable TV, WiFi, washer and dryer, enclosed outdoor shower, gas grill, garage for tenant use and air conditioning units in the living room and master bedroom. The home is conveniently located. Marconi Beach on the ocean side is just over two miles away. Head towards the bay where you can launch your kayak and enjoy wonderful walks. 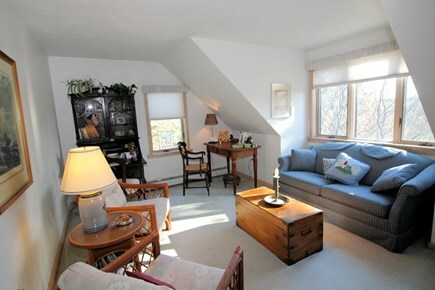 Short drive to Wellfleet's beloved ponds, bay and ocean beaches. The Cape Cod Rail Trail, Mass Audubon's Wellfleet Bay Wildlife Sanctuary and the Wellfleet Drive-In are all nearby. Head to Wellfleet Center and Harbor for amazing dining, galleries and shopping. 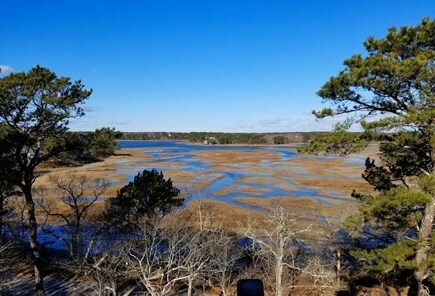 Short drive to WHAT (Wellfleet Harbor Actors Theatre), golf, tennis, sailing and the amazing natural history sites and trails of the Cape Cod National Seashore. Head up to Provincetown for more dining, shopping, live entertainment and whale watching. Off-season short stays available: Three-night minimum, $600 per night plus a $300 cleaning fee and all other applicable fees. Call or email for information or to book. Additional pricing info: $125 non-refundable reservation fee (no security deposit required); cleaning fee on minimum stays. State and local taxes of 12.45% will apply.